In 1542, the Holy Office established the Roman Inquisition in order to battle heresy and reinforce Church doctrine. From then on until the 18th century, the Roman Inquisition investigated and prosecuted various forms of heresy generally in Italy, Avignon, and Malta. Yet, since there are many preconceived notions on the topic of the Inquisition, it would be worthwhile to delineate standard procedure in Roman inquisitorial hearings so as to expand one’s understanding of Cecilia Ferrazzi’s ordeal and European history as a whole. There were two ways in which the inquisitorial process could begin: first and more commonly, with a denunciation by some accuser, and second and rather infrequently, with the inquisitor’s determination to examine someone who he believed to be committing heresy. In the case of the former method, the inquisitor then interrogated the accuser in order to better understand that person’s claims as well as to gather evidence for the prospective trial. Should the inquisitor have felt there was sufficient evidence or that there was an issue worth pursuing in the case, then the suspect was summoned to court. If the claims were baseless or unimportant, then the process ended. At this point, the accused was interrogated and granted the opportunity to refute the accusations, but if the inquisitors were not satisfied with the rebuttal, then the trial proper began. If the inquisitors were convinced, then the suspect was free. The first stage of the trial proper was the processo informativo in which the inquisitors would continue to interrogate the suspect and attempt to procure a profession of guilt from the accused. In order to gain this confession, the inquisitors would present the defendant with witnesses’ testimonies denouncing him/her or his/her actions in addition to physical evidence that points toward his/her guilt. Very rarely, if the suspect proved to be either uncooperative or if he/she had been convicted of heresy in the past, then the inquisitors utilized torture, so long as they gained approval from the Holy See. Should the accused have persisted in maintaining his/her innocence, then he/she was granted the right to consult a lawyer. However, in the context of the inquisitorial proceedings, the lawyers seem to have been another manner in which to extract a confession in that they appeared to have simply advised the accused to confess. If the suspect failed to heed the legal counsel, the trial entered into the processo difensivo phase wherein the defendant and the lawyer formed a series of questions to be posed to the witnesses who had already been interrogated, a list of the suspect’s enemies from whom testimony should be disregarded, and a list of more witnesses to be questioned. The inquisitor then reexamined the witnesses, struck out those whom he felt had given unreliable testimony, and questioned new witnesses. After the processo difensivo or the processo informativo, if the accused made no defense, the Holy Office reflected upon the trial and eventually came up with a verdict. Either the suspect was absolved of the charges or he/she was forced to sign a document which confessed his/her guilt and listed the crimes that he/she had committed. Thereafter, the punishment was decided upon and told to the person convicted of heresy. Punishments were given in proportion to the offense and as such lesser crimes generally merited penances, fines, or minor corporal punishment, whereas major transgressions, such as repeated offenses or denial of basic Church doctrine, could potentially warrant the death penalty. Finally, the convicted had the right to appeal the judgment or to petition the Holy Office for a less severe sentence. From this framework, one is able to better understand what exactly was happening after Cecilia was accused of heresy. First, her accusers brought their claim before the inquisitors. Next, the inquisitor decided to pursue the case. Then, Cecilia professed her innocence and in the ensuing interrogations continued to do so. Subsequently, she attempted to form a defense, which appears to have been her autobiography itself for it lists possible enemies and potential witnesses. Thereafter, the Holy See found her guilty and punished her relatively mildly with jail time. Finally, she took advantage of her right to an appeal and was absolved of the charges against her. Clearly, her trial was not some arbitrary affair in which evil inquisitors torture innocent victims, but rather the trial conformed to certain standardized procedures that had to be followed. Although the Roman inquisitorial procedure was regulated and standardized by the Holy See, it nevertheless granted an extraordinary amount of power to the inquisitors. Therefore, one can debate whether or not the accused truly had a fair trial. The defendant appears to have had many rights including the right to an attorney, the right to form a defense, and the right to appeal a verdict. Still, it seems to have operated on the assumption that the suspect was guilty until proven innocent and for that reason one could argue that the accused could never receive a fair trial. Even so, this procedure proves that the Roman Inquisition is far from the covert torture and executions that many imagine it to be. ↑ "Roman Inquisition." Encyclopædia Britannica. 2009. Encyclopædia Britannica Online. 26 May. 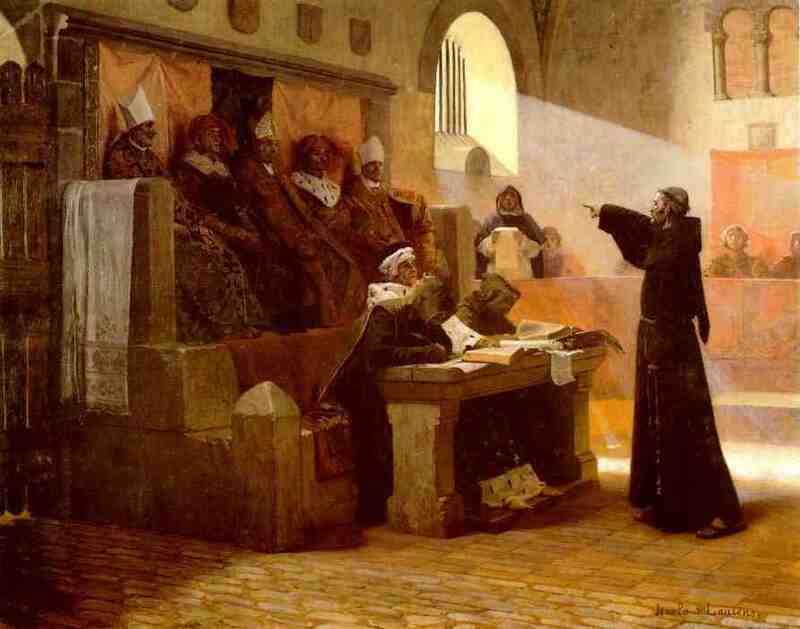 2009 <http://www.britannica.com/EBchecked/topic/507752/Roman-Inquisition>. This page has been accessed 16,653 times. This page was last modified on 7 June 2009, at 06:24.